For Dr. Steven A. Brisman, an early aptitude in math and science blended with a love of artistry. That developed naturally into an interest in dentistry - that place where art and biology meet. Dr. Brisman attended college at Washington University in St. Louis to achieve his BA degree. He received his DDS from the University Of Pennsylvania School Of Dental Medicine then served as a resident. He followed that up as Chief Dental Resident at North Shore University Hospital. Dr. Brisman received his certificate in Prosthodontics upon completion of his post doctoral work at the New York University College of Dentistry. "I wanted to be a master of my trade, which led me to choosing a dental specialty,” says Dr. Brisman. “I was fortunate enough to be mentored by several of the founding fathers in the field of Periodontal Prosthesis, which exposed me to Prosthodontics”. Dr. Brisman says his favorite patient is one who comes to him and gains confidence in his skill as a clinician. This in turn leads to relief for them that they have found a dentist who is able to restore their teeth. Which gives them optimium dental health and a better quality of life! 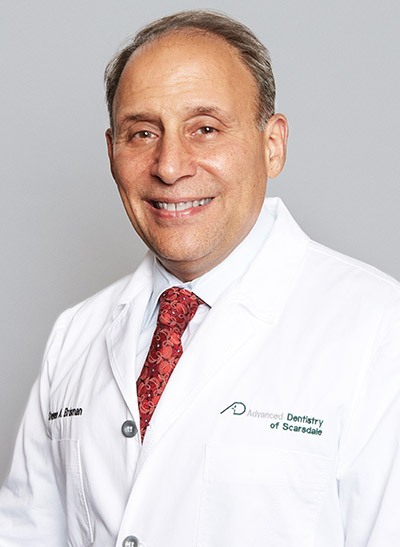 Dr. Brisman is the developer of Advanced Dentistry of Scarsdale in Westchester. It's a multidisciplinary practice providing a full range of dental care. He also developed an an on-site, boutique dental laboratory called On-the-Mark Laboratory. It works in tandem with the dentists to create customized dental prostheses for the practice’s patients. “My goal for the practice is to provide excellence in treatment, absolute commitment to our patients, and a five star service experience”, says Dr. Brisman. “A state-of-the-art laboratory, on the premises of a full service dental facility, filled with clinical experts, means we can deliver top-of-the-line care for any patient”. When he’s not restoring smiles, Dr. Brisman is spending time with his wife, two teenage children and two golden doodles. The family enjoys going to the kids’ athletic events, skiing, beach vacations, and relaxing at home. Dr. Brisman also gives back to his community by hosting a mentoring program and dental “externship” program for undergraduate students. He also works with non-profit organizations to promote and market the science of prosthodontics. For one of the best in Westchester prosthodontics, schedule an appointment with Dr. Brisman today.